Facebook keyword search by URL ID numbers to return targeted profiles that can’t be searched though the search bar. 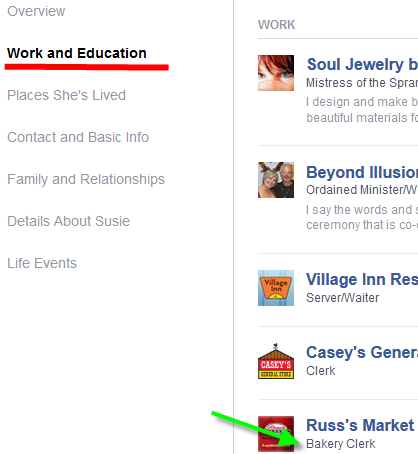 One of the blog posts in Five Sourcing Tips I Learned From Others that sourcer/recruiter Irina Shamaeva recommends is The Facebook #Sourcing Tutorial. Invoke your powers of concentration and carve out a bit of time to absorb this step-by-step guide to keyword searching within Facebook by manipulating the URL rather than using the natural language of the Facebook search function. The author’s technique inserts the URL ID numbers associated with an “Interest” page or/and an employer “Work Experience” in the URL to return targeted profiles that can’t be searched though the search bar. If you’re looking for groups of people by identifiers other than their names this is a valuable approach. You’ll have to read through the author’s post (many times) before shaping your particular search. While this is a more refined method for finding people, still, it only searches words that are somewhere in the “About” area of the profiles. Most work titles in the list of profiles have the word “baker.” But there are also ones that show my keywords in a work experience of a former employer. On the selected profile page, go to the “About” section and click on “Work and Education” to find the keyword that’s not in the employer title but describes her past work. There may be multiple “Work Experience” pages (and therefore ID numbers) with the same title. Make sure to search all the ID’s. 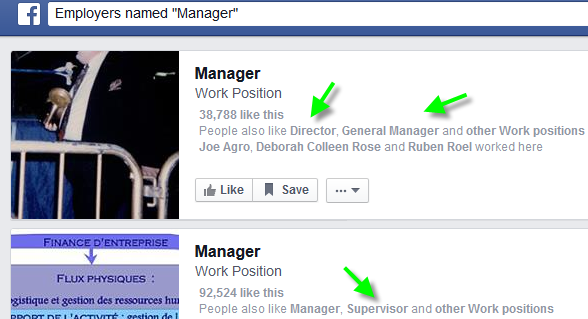 These two results for “Managers” also suggest related titles with pages. 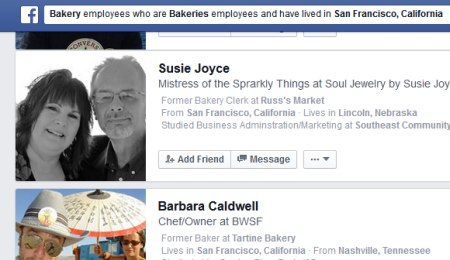 Note the number of users who selected the identified ‘Interests named “bakery.”‘ Drill deeper to find related Interests pages. There’s no mention of San Francisco but the towns where this user has lived are nearby. 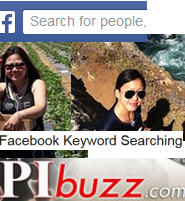 What are your Facebook keyword search discoveries? Facebook keyword search by URL ID numbers to return targeted profiles that can't be searched though the search bar.